Sure, dredging your meats and vegetables in a simple flour coating for a quick fry is the easiest route, but it’s certainly not the most delicious one. 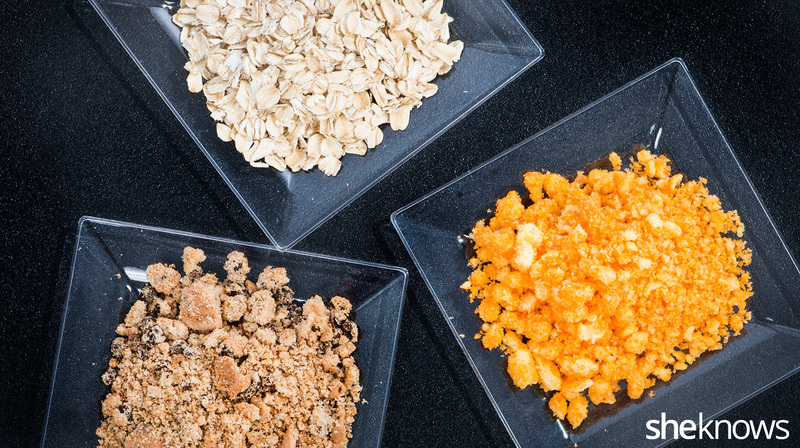 You can coat your fried items with all kinds of good stuff, from the more traditional (like crackers) to the super-surprising (like a sweet cereal) — and chances are you already have most of these items in your cupboard. Let’s face it: There’s nothing yummier in the world you can do to food than coat it, deep (or shallow) fat-fry it and maybe hit it with a little salt for good measure. No matter how bad something is and no matter how good it is, it can always be better when fried to a deep golden-brown. Of course, we believe you can’t have too much of a good thing, which is why when we fry, we make sure to coat our fried foods in the usual flour or batter and then dip the whole thing into a delicious coating. If that sounds like your kind of frying party, then get out your oil. You’ve got some coating to do. Chex (and all its imitators and generics) has a very firm, crispy exterior that stands up extremely well to frying. It also helps that the numerous varieties of Chex also taste pretty good too. All you need to do is use your hands to break up the Chex, and roll your fried foods in it for an extra bit of crunch and a nice earthy flavor too. Something sweet doesn’t work with all fried items (fried okra plus Fruity Pebbles sounds nasty), but for certain items — children’s chicken fingers, fish sticks, etc. — coating the food with Fruity Pebbles can produce a nice sweet-savory combination. You will need to crush the cereal, most likely with a meat mallet or rolling pin, but other than that, Fruity Pebbles are easy to add to your meal. If you’re making a batter, consider switching over to garbanzo bean flour instead of white flour. The gluten-free flour will produce batters that are much denser and have a sweeter, more intense flavor. 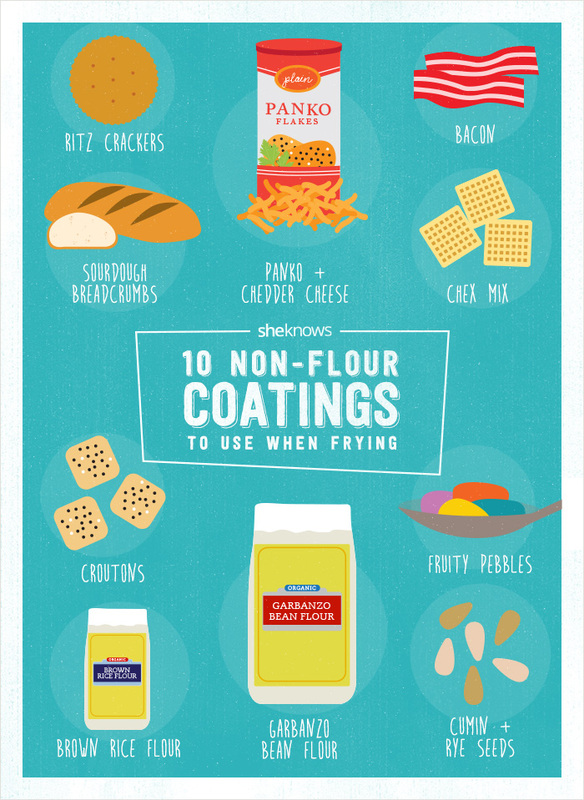 You can also dredge your fried items in garbanzo bean flour too. Brown rice flour is another great flour alternative. We really like to use it to dredge fried items because we like the hint of brown rice it gives the final product. It can also be used to make a batter. Ritz crackers have an unctuous, buttery quality that makes them ideal to coat fried foods. Why ideal? Who doesn’t want more butter and fat with their fried foods! The key, though, to using Ritz crackers in your fried foods is to grind them very finely. If you have pieces more than a few millimeters to a side, then the texture of the final product will be weirdly soggy. What you want to do is make a Ritz dust and roll your fried food in that for a delicious buttery kick. Yes, that’s right, you can roll some fried foods in bacon. To make this work, crisp up your bacon, and cut it into fine pieces (think bacon bits from a salad bar). Also, you’re going to have to use a batter or roll the fried food in egg wash so that the bacon has something to which it can stick. If you have that, it’s just a matter of rolling the food and hitting the fryer. Cheddar cheese by itself cannot survive in the fryer as a coating. That’s why you take a small amount of it and mix it with something like panko (or one of the other suggestions on this list, like croutons or Chex). Then coat the food normally. The end result won’t be terribly cheesy; rather it will have an additional richness and saltiness that come from the cheese. More and more, store-bought croutons are being shunned in favor of homemade croutons, or they’re getting left off entirely because they’re carbs. With that said, a lot of packaged croutons are really delicious and come in a variety of different flavors. If you have a crouton you like, just toss a few handfuls into the blender, and pulse until you have a very coarse breadcrumb. Use that to coat as normal. First things first. If you’re going to use cumin and rye seeds, do so sparingly. They both pack a huge punch, but if you can get them to stick using a wet batter, you’re going to have a fancy, flavorful fried dish. Day-old sourdough bread makes an excellent coating because of its unique flavor, which translates to the fried food if you use it as a coating. Just pulse in a food processor until the texture of sand, and coat. Of course, that astringent tang doesn’t work with all foods, but for some stronger vegetables, chicken or beef, it can be a very welcome change of pace. Originally published Jan. 2015. Updated Oct. 2016.